I know Charlie is running 2 gpus and a cpu in a loop with a 2x120mm rad. Is there anybody else with input on this idea. 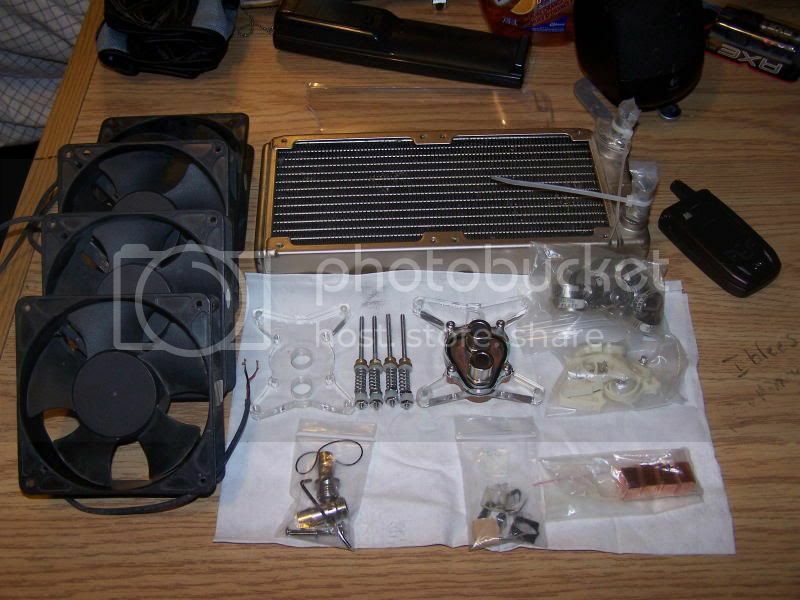 I have 2 MCW60s and an older DD cpu block, a MCP655 Vario and an unidentified 2x120mm radiator I bought from some guy I am Pretty sure it is a dual pass rad though.) I am planning on running this along with a DD Dual Bay Res to cool my rig. It will be a q6600, 2 gts250s with the rad mounted internally at the top of my cm590. I fold on the cards (don't really oc them - nudge the shaders a little) and the cpu will likely run at around 3.2GHz at low vcore. Some tell me not to run gpus and cpus in the same loop, but I am not looking for the record temps or anything like that. I just want to be able to fold on this 24/7 (gpus only) without keeping the entire house awake from the roaring fans. If you want to post a picture of the rad, someone could probably identify it, which would ensure that you're not trying to use a serious piece of crap or something. Also, what's your idea of a quiet fan? You shouldn't have any trouble running that sort of setup. Your temps will definitely be higher than normal, and honestly, you could probably get just as good temps with good aircooling, but it will work. Just make sure you properly clamp all barbs (the warmer water might manage to make the tubing slightly softer). The rad is in this picture. I sure hope so. They are a great rad AFAIK. could you give us a estimate of the tickness ? Can't quite place the rad. It's either a a PA120.2 (but the fan holes look too close together) or an XSPC RX-series radiator, although those are pretty new (and there should be a stamping somewhere to identify it). Either would be excellent. I really don't think that's a thermochill, it doesn't look thick enough nor do the fan spacings look correct. My bet would be a Black Ice or maybe a Magicool rad. Better Image showing the side profile would make it easier. Definitely not a thermochill.. not of anything recent.